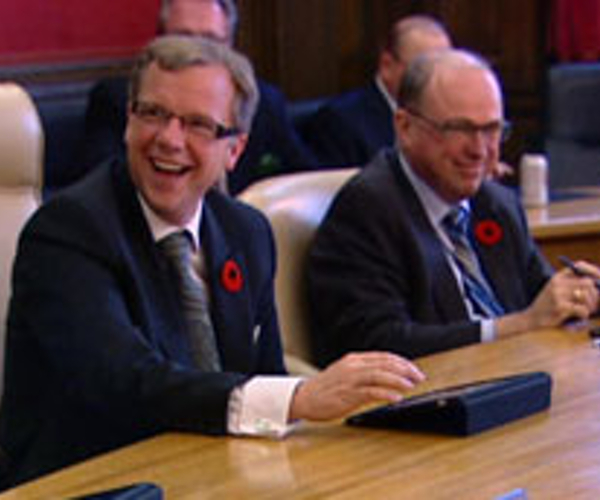 Saskatchewan Premier Brad Wall convenes the first cabinet meeting where his ministers brought iPads to the session. The portable computer devices have been touted as a way to conserve paper and reduce courier costs. Wall and his cabinet of 17 ministers were each issued an iPad. A handful of senior bureaucrats were also provided with one of the devices for a total cost to taxpayers of about $23,000. It was earlier estimated that the annual savings could amount to about twice that initial outlay. 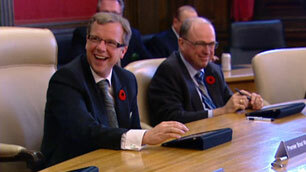 via CBC News – Saskatchewan – IPads arrive for Sask. cabinet. The fact that the Saskatchewan government is expecting to save more than twice the cost of buying the iPads in the first year alone I’m surprised that American tax payers are reluctant to support the same thing in city councils. Look, take the environmental part of out of it (saving paper/trees/etc) and just look at it as saving money. If governments can run more smoothly and cheaply by adopting new technologies, why not do it? I laud the Saskatchewan government for this bold move (it really is pretty ground braking) and maybe other jurisdictions will take note and follow suit.